Single Level Sanctuary on Lodge Hill! This two bedroom, one bathroom cottage is close to town and yet feels like an oasis far from the rest of the world. 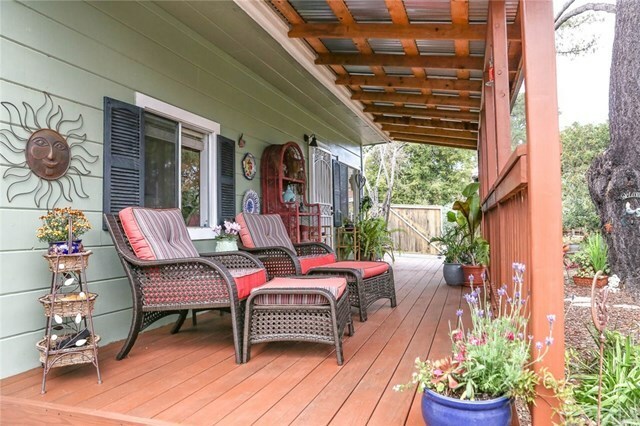 Enclosed within wood fencing, and two security gates with automatic openers, are a low maintenance yard off the front porch, plus a sunny and private area with a Jacuzzi. There are also two parking pads and two sheds within the fencing, plus room for RV parking outside. Entering the front door, you will find a warm, sunny and inviting living room and dining area. Adjacent to this is a recently remodeled kitchen with stainless steel appliances (gas range, microwave, and refrigerator), and an area for a bistro table and chairs which overlooks the beautiful front porch and gardens. There is a full bathroom designed in decorative black and white, so that you can add any colors you desire to personalize the space. Two bedrooms are separated by a hallway, containing a new stacked washer and dryer in its own closet. That area could be converted to a second bathroom, if so desired. With many windows, wood tone flooring, a unique archway into the kitchen, and warm wood paneling in the second bedroom, this home is bright, charming and cozy. Unlike some areas of Cambria, there are few vacation rentals, thus the neighborhood has a truly local feel and is peacefully quiet. All appliances and Jacuzzi included make this gem move in ready! Directions: From Highway One going north, turn right on Burton and left on Wilton. House is on the left.